‘Caran d’Ache’ was the pseudonym of Emmanuel Poire. Originally born in Russia, he used the Russian word for pencil ‘karandásh’ as his ‘nom de plume’. He became a renowned caricaturist and illustrator who excelled in military subjects. He contributed to numerous publications including Le Rire. 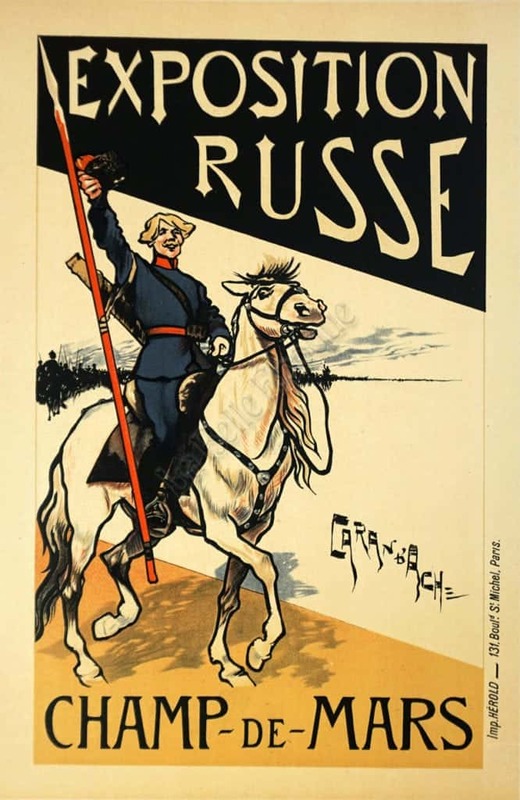 His wonderful bold poster for the Russian exhibition at the Champ de Mars in Paris shows a proud Russian soldier astride a magnificent marching white horse. He signals us to join him with what appears to be the entire Russian army following in tow, for as far as the eye can see.